Better Than Never: We Have a Venue! After debating which state we should get married in, researching the hell out of everything in our tiny budget, and visiting venues in both New York and North Carolina, it is finished. We have a date and a venue. 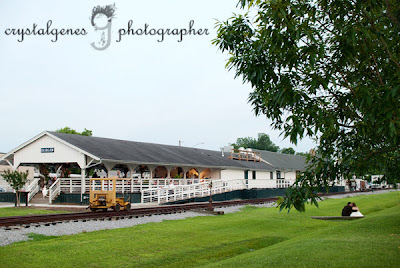 We will be getting married on November 10, 2012, at the historic Train Depot in Burgaw, North Carolina. Outdoor patio area, for ceremony and wine. I didn't take the best photos during our tour, but the space has so much potential. It's located about 30 minutes outside of Wilmington, which is the one and only downside. Everything else about it is pretty much perfect. It's quirky (one of the oldest train depots in the country), it's pretty (gorgeous floors, high ceilings, and chandeliers), it has space for an outdoor ceremony and cocktail hour on the deck and an indoor sit-down dinner/dance party, and it only cost - get this - $600 for the whole day, which includes tables, chairs, and linens. That is by far the cheapest site fee I have ever seen, and we paid the cost in full Friday evening. Our wedding won't be homeless after all! 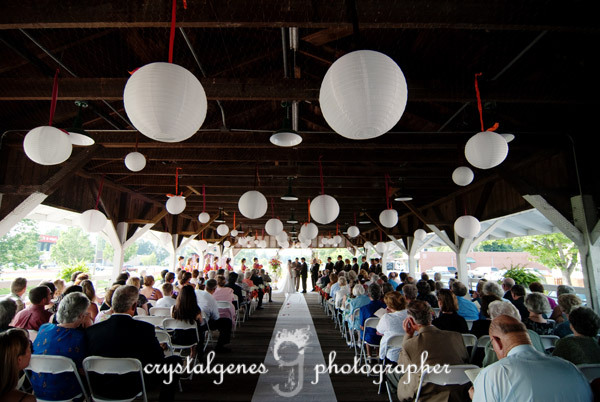 And just in case the photos above have not convinced you that we will throw a downright lovely wedding, check out this post from another couple who got married at the Depot. It was after looking at these photos that we decided to drive out to Burgaw and see the space for ourselves. And we're so glad we did! I am SO GLAD that we've finally got the venue settled. I feel good about the Depot in a way that I haven't about any other place we've looked. I can actually picture us getting married there, making memories, celebrating with friends and family, and kicking off the next stage of our lives. It suits both our personalities (I like the charm and quirkiness, Nathan likes the historic aspects and the outdoor options), and best of all, it won't eat up our entire wedding budget. You can't get more romantic than that.